South Africa produces an average of 1,7 million tons of wheat annually, while the annual average total commercial demand for wheat amounts to just over 3 million tons. In order to meet total commercial demand, South Africa relies on imports which are usually between 40% - 50% of local consumption. South Africa is therefore a net importer of wheat. There lies potential to grow the wheat production locally, however this is constrained by the high volume of imports that enter the country. Low international wheat prices, which are caused by subsidies in developed countries, has placed pressure on the growth possibility of the local market which has been uncompetitive at the low international wheat prices. The wheat tariff is calculated by means of the variable tariff formula in order to ensure that the prices local wheat prices are supported when the international prices are at low levels, but that when the international prices are high the local consumers are not influenced negatively. The tariff is therefore only active when the international prices drop below a certain price level which is called the international reference price. This price is set equal to an international wheat price of 9/ton and the tariff will only be in place when the international prices are below this level. Currently the international market trades below around 5/ton and therefore the tariff is in place. Graph 1 indicates the international wheat prices with the reference price level shown as well. 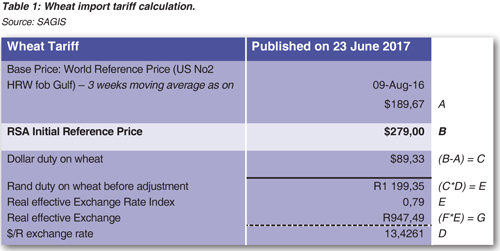 It is clear from graph 1 that the international prices are well below this level and the purpose of the tariff is to fill the gap between the reference price and the international price. The Base Price is the 3-week moving average calculated as at 9 August 2016. 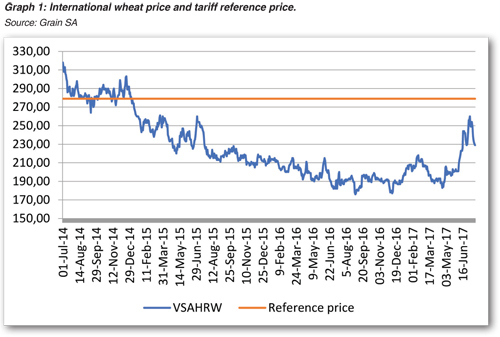 This value is subtracted from the Reference price, which is calculated by taking an average price of the past 5-years of US Hard Red Wheat No.2 (as at 09 August 2016), plus adjustments for distortion factors (international subsidies), then subtraction of average transport costs to South African shores. The difference between these two variables (B-A) is the wheat tariff rate in dollar terms. This rate must then be converted to Rand terms which is then calculated by the published real effective Exchange Rate Index to obtain the final wheat import tariff. From the calculation above, it is therefore clear that the only adjustment made was on the RSA initial reference price. The wheat import review does not have a direct effect on local wheat prices; the only effect is that imports are now imported at the 9 dollar level. The wheat import tariff is imposed to protect the local industry and to make it possible for local producers to be able to compete with wheat that is imported at lower levels. The higher the international wheat prices, the lower we can expect the import tariff to be. Therefore, it can be concluded that wheat import tariff does not increase prices; it only changes the reference price level of 9.